When my boyfriend and I discussed getting a dog, I was pretty sure I knew what we were getting ourselves into. I’d grown up with dogs, after all, and I was familiar with the puppy puddles, the trickiness of recall training, and the chewed slippers. 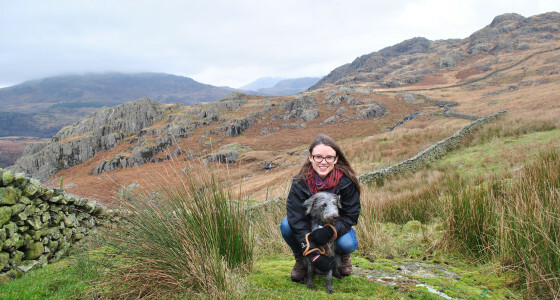 But when we brought home our scruffy little bundle of fur (Wilbur is a cross between a Bedlington terrier and a whippet) it turned out there were actually a lot of things I had to learn. I’ve always lived in London and the south east, an area that isn’t exactly renowned for its friendliness. Before having a dog, I never really knew any of my neighbours. But as soon as we started taking Wilbur to the local park, that changed completely. I now know half the people who live on my street and regularly chat to fellow dog-owning neighbours. We also help each other out with dog-care. I thought that the desire to chew everything waned when dogs grew out of puppyhood, but apparently not. In particular, Wilbur loves the taste of leather. He was recently sitting quietly under the table in a pub, and when I got up to leave I realised he’d chewed completely through the strap of my leather handbag. The world of pet insurance is quite complicated. When I was buying a policy, I discovered that a ‘lifetime’ pet policy rather than a limited policy seemed to be the way to go, as this should mean cover in the case of chronic illness. If you have a non-lifetime policy and your pet has a long-term illness, this illness will usually be excluded when you renew the policy, so you won’t receive further payouts for this condition. A lifetime policy means that a condition is covered year after year up to a limit that refreshes on renewal. As a result, lifetime insurance policies tend to be quite expensive. I also quickly discovered that even if you have pet insurance, you’ll still have to pay rather a lot of vet bills. Standard procedures like vaccinations, worm/flea treatment and neutering aren’t covered by your pet insurance. Plus, your insurance will have an excess (£99, for example), which is the contribution you have to make towards a claim. The cost of trips to the vet for minor ailments and injuries will often fall below your excess, so it will be cheaper to pay yourself. In April 2016, a year after we got Wilbur, it became a legal requirement for all dogs of over eight weeks to be microchipped. The microchip is inserted under your dog’s skin by a vet, and when scanned it shows an identification number that’s matched with your details on a database. It means your dog can be reunited with you if it gets lost. Remember to update your details with your vet if you change your number or move house. Some taxis will allow dogs too, but it’s usually at the driver’s discretion, so make sure you check when you book. A huge number of British pubs are dog-friendly, as you’ve probably discovered when you go for a Sunday roast and have to step over a couple of labradors to get to your table. But a surprising number of other places are dog-friendly too, including some cafes, shops and even your local bank branch if you have a Metro Bank account. I opened a Metro Bank account around the time I got Wilbur, because pets make bank appointments much more bearable. Dog treats can be surprisingly expensive, and when you’re training your dog you can get through quite a lot of them. Instead, I discovered that you can make your own by dehydrating strips of meat or vegetables. If you don’t have a dehydrator (does anyone?) then stick them in an oven on a low temperature until they’re dried out. I thought that one of the major costs of having a dog would be paying for dog care if we were away, but soon after getting Wilbur I discovered BorrowMyDoggy. Dog lovers without their own pets can sign up to walk or take care of your dog while you’re busy or away. You pay a small annual fee for using the service, but the dog care itself is free, because the ‘borrower’ is getting the benefit of your dog’s company! Once I’d put up a cute picture and a gushing description of Wilbur, I was inundated with messages from people nearby who wanted to meet him. Plus, neighbours, friends and family are also happy to help out, and we return the favour when they need a hand with their dogs. All in all, we rarely end up paying for dog care. Thinking of getting a pet? Tell us in the comments below. Are you in control of your pension? Your pension is just as important as your furry friend. Sign up to PensionBee and put your pensions in one place.